HOT PEPPER - CAROLINA REAPER RED- GENUINE HP22B - 10 SEEDS - WORLDS HOTTEST. 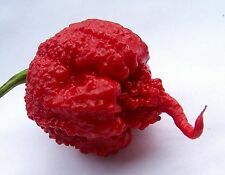 Carolina Reaper is officially the hottest pepper variety in the world you can grow reaching an average of 1.5 Million Scoville units with a tested peak of 2.2 Million Scovilles (Guinness book of records). Many winter Squash / Pumpkins like to sprawl out and need plenty of space. Vining Squash / Pumpkins require a larger area to run, whilst semi-vining and bush varieties of winter squash / courgette can be well contained. 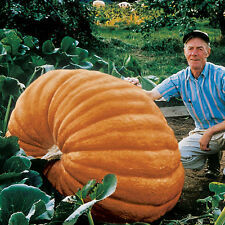 PUMPKIN - DILLS ATLANTIC GIANT - 22 FINEST SEEDS. Many winter Squash / Pumpkins like to sprawl out and need plenty of space. 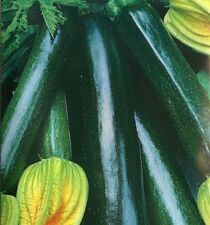 Vining Squash / Pumpkins require a larger area to run, whilst semi-vining and bush varieties of winter squash / courgette can be well contained. 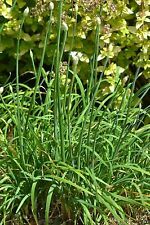 Both leaves and flowers have a pronounced garlic flavor, although milder than bulbs, that adds zest to salads, stir-fries, rice and noodles. Leaves freeze well. Can be grown all year round potted on a windowsill. The majority of our seed are now supplied in quality clearly labelled foils to ensure the freshness of seeds. A small number will be in sealed Ziplock pouches dues to seed size. Quality of seeds. The critical part is temperature, these need at least 65F continuous soil. 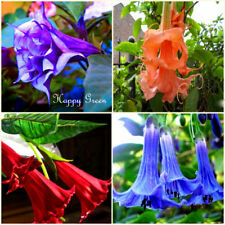 The species grows giant trumpet shaped yellow, orange, pink, white or purple flowers that hang down from the tree. However, Brugmansia suaveolens can still be enjoyed in colder climates by growing them large containers and bringing them indoors for the winter months. A stunningly beautiful flint / popcorn variety producing cobs in an endless kaleidoscope of colours with Translucent kernels that shine brilliantly like glass beads. The plants are vigorous and can reach 2m and thus not suited for exposed sites. An excellent hardy ground cover perennial, perfect for for rockeries, walls, borders, edging paths, planters and window boxes producing a stunning mass display in early spring. · When large enough to handle transplant to trays or pots and grow on. A highly aromatic, spreading plant with dark-green, sweetly aromatic spearmint leaves which can be extensively used as garnishes and flavoring. This perennial grows to 3 feet tall and spreads rapidly. CALENDULA FIESTA GITANA. The plant has terrific pest-fighting abilities as well. Its flowers attract good bugs into the garden and help repel the less desirous bugs. (Calendula officinalis nana). Lightly cover the flower seeds with peat moss. Mélangez les graines de coquelicot, et procédez par petites surfaces. Pour obtenir un effet naturel, il est préférable d’opter pour un semis à la volée. Dans le folklore français, les noces de coquelicot symbolisent 8 ans de mariage. TOMATO CHERRY - SWEET MILLION F1 - 22 FINEST SEEDS. 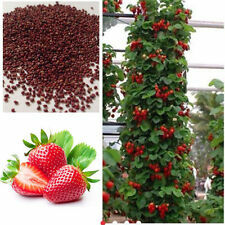 A very heavy cropping F1 cherry variety producing huge amounts of cherry sized extra sweet bright red fruits. A robust variety it will perform well under glass or outdoors in a sunny sheltered location. Asking only full sun, Catnip grows readily in poor, dry, sandy, or hot soils where little else is successful. To reduce self-sowing, cut it back after bloom. 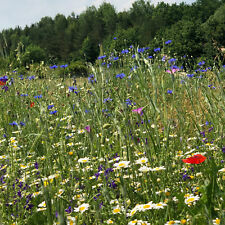 Irresistible to bees, butterflies, beneficial insects and a favourite for cats. The Sunflower plants are a good size for the back of the border as well as next to outbuildings. Sunflowers work well as a temporary screen, too! All our seeds have phytosanitary certification and are laboratory proven to have high germination. TRAILING PETUNIA MIXED - Petunia hybrida pendula. (Petunia hybrida pendula). This Petunia mix is an excellent choice for hanging baskets, balcony, planters, and window boxes, it will bloom from late spring until frost season begins in the autumn. Comfrey is a herbaceous perennial her b with large, hairy leaves and grows in a rosette to 1 m (3’4”) in height. Comfrey leaves are about 17% nitrogen (horse manure is about 14%) and the leaves readily decompose when soaked in water to make an organic liquid manure. BROCCOLI - CALABRESE - GREEN SPROUTING - 1000 SEEDS - ORGANIC. Sow directly into the garden or trays. A popular very hardy Italian heirloom variety growing to 30-36 in. high, producing flavourful 3-6 in. We are based in Wrexham North Wales. Prepare the ground removing all the weeds and then raking to a fine tilth.Sow seeds thinly on on freshly cleared ground. This wonderful mixture has a dual purpose. In un secchio - da marzo a maggio. Tempo di fioritura : Giugno - Agosto. Purtroppo in Germania la coltivazione è soggetta ad autorizzazione! CAPE GOOSEBERRY(PHYSALIS PERUVIANA) - 0.3 GRAM ~ APPROX 290 SEEDS. The majority of our seed are now supplied in quality clearly labelled foils to ensure the freshness of seeds. A small number will be in sealed Ziplock pouches dues to seed size. · Chill the seeds in the refrigerator for a week before planting in order to break the seeds dormancy. The majority of our seed are now supplied in quality clearly labelled foils to ensure the freshness of seeds. The majority of our seed are now supplied in quality clearly labelled foils to ensure the freshness of seeds. A small number will be in sealed Ziplock pouches dues to seed size. Quality of seeds. Dedicated growers with over 25 years of experience. (Nepeta mussinii faassenii). The plant is very easy to grow from flower seed, and if the seeds are sown early in the season, it will bloom the first year. It is a perennial that blooms like an annual. One of the best low growing ground cover perennial plants available, producing a matt forming carpet of dense dark green foliage covered with violet & purple shaded flowers from May To Aug. Reaches no more than 10cm high and spreads up to 30cm. French or flat parsley generally has a sweet more delicate flavour than curled parsley making it ideal for more general cooking use. The plants are vigorous with district flat leaves. Ideal for growing in the Veg patch, containers or the kitchen windowsill. Best suited to a shady spot, but will thrive in most soils. Freely self-seeding year after year. Stunning at the back of a border or in any shady corner. The majority of our seed are now supplied in quality clearly labelled foils to ensure the freshness of seeds. Saponaria ground cover will provide a superior flowering, low-growing, low-maintenance plant, and it is easily grown by sowing. Soapwort is an ideal selection for hanging over walls or crevices, beds, borders, and gardens. Outstanding quality runner bean producing good length pods (30cm) of uniform shape and size from red flowers. Stringless with excellent texture and taste. The majority of our seed are now supplied in quality clearly labelled foils to ensure the freshness of seeds. Model Number:Purple Potato Seeds. quantity: 100 Seeds. Classification:Novel Plant. We are sure that we will give you the best solution in every single trouble that you want us to resolve. Applications: Balcony, garden. 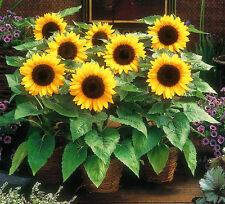 What a cheerful plant for any sunny location and so easy to establish from dwarf Sunflower seeds! Sowing Start sowing indoors as early as February or March. Plant out in April or May on 25 x 40 cm (10 - 15in) space. A vigorous climbing Nasturtium which will reach 1.8m with support or equally effective as groundcover. With attractive variegated foliage it produces an abundance of single petaled flowers in a mix of yellows, reds, creams and peach/pinks. One of the best low growing ground covers, Thymus serpyllum forms evergreen dense cushions 5 to 10cm (2 to 4in) tall. The stems creep along the ground rather than rise vertically and grow 10 to 30cm (4 to 12in) long. (Passiflora Caerulea). Passion Flower (Passiflora Caerulea) is an exotic, wonderful plant for your garden! Passion Flower fruit are egg-shaped, orange and edible but not very noteworthy. Seeds have phytosanitary certification and are laboratory proven to have high germination. 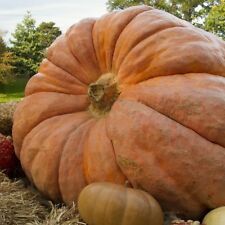 Table King is an outstanding winter acorn squash and one of the earliest of the acorn varieties. High quality, fiberless orange flesh is thick and flavorful. Many winter Squash / Pumpkins like to sprawl out and need plenty of space. Stipa is a ‘must have’ for many garden designers. The silvery-white flower panicles make this grass a very attractive addition to the landscape. Season: Perennial. Sow the seeds and keep them in the first 2-4 weeks over 18°C. PAPAVER SOMNIFERUM "TURKISH WHITES" POPPY SEEDS - FASTEST GERMINATING POPPY SEED. These seeds were the clear winner and also had a very impressive germination rate. We will upload the video as soon as it is completed. Because Giant Hyssop is highly scented, it is an excellent attractant to hummingbirds and butterflies. One of the easiest and most rewarding perennials to grow from flower seeds! It is useful for adding a spot of color to the garden late in the season when many other plants are finished. Questi alberi sono piante di lunga durata rispetto alle classiche piante di pomodoro. Talvolta, se protetti in inverno, si e' riusciti a farli vivere persino per 2 o 3 anni! Ideale per insalate e panini. (Festuca glauca). It has good winter color and looks green during this period. Drought tolerant. BLUE FESCUE SEEDS. Seeds have phytosanitary certification and are laboratory proven to have high germination. 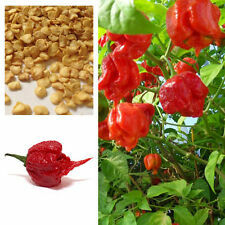 HOT CHILLI PEPPER - HABANERO CHOCOLATE - 60 SEEDS. The plants can reach 3ft but take longer to mature than others, so best started early. Rated as 425-600K Scoville units, this is a real chilli experts chilli with a rich fruity/smoky flavour. What a charming, delicate flower! Since this variety is trailing, it also is excellent in rock gardens, trailing over rock walls, or in pots. It's delightful wherever you decided to grow it! Baby's Breath has papery rose blooms and soft gray-green foliage. Portulaca Grandiflora. Arrosez très peu. Les fleurs ne s'épanouissent qu'au soleil. Par conséquent, nous ne pouvons prendre aucune responsabilité quant à l'efficacité de vos plantations en fonction de vos conditions climatiques locales, les suggestions de plantation fournies et les récoltes qui peuvent changer en fonction de la variété plantée. It makes an excellent potted herb and can be grown successfully indoors or outdoors. Prefers warm conditions and full sun. Height up to 40cm. The majority of our seed are now supplied in quality clearly labelled foils to ensure the freshness of seeds. Ce bambou magnifique et vigoureux fait partie de divers genres, à savoir Fargesia, Yushania, Borinda et Sinarundinaria. Ils présentent des gaines persistantes et coriaces aux magnifiques rayures violettes. Humulus lupulus CASCADE HOPS Vine Seeds!